The Arbuckle Family Blog: Need to make some last minute Valentine's? Need to make some last minute Valentine's? Ok, so my clock says it is 4:18am. I have been up since 2am. I mainly think it is because I was put in a frustrating situation today and I can't get it off my mind... but in the midst of replaying what happened, I remembered that tomorrow is Kate's Valentine's Day Party at her school. Since I can't sleep, I thought I would make some Valentines for Kate to take to school and post it on my blog for those of you parents who might want to make these easy Valentines. Trust me, they are so cute and I had everything here at home to make them. 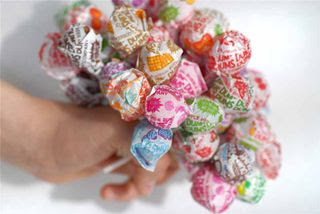 I also have to think they will be a big hit.. because most kids would rather have a lolly pop, than a piece of paper that says, "Be my valentine". 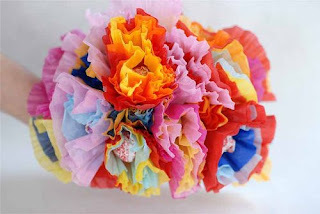 You'll need circles of tissue paper measuring 4-5 inches in diameter (doesn't have to be exact). I did this by cutting squares first, then rounding the corners to make circles. I used a layer of 3 tissues per flower, you could use a couple more if you would like. To find the center of the circles, fold the set of three lightly in half first, then fold again to quarters. When you open it up, there will be a little creased X in the middle. I made tags to place in the center of the flower. I crimped the paper first, then removed the Dum Dum and slid the tag through the dum dum stick and pushed it back through the tissue paper. Pinch the base of the lolly really well and tight, so the scotch tape can go on snugly. 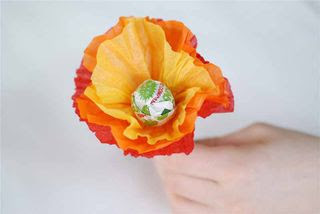 Place a small piece of scotch tape around bottom of flower to secure. I hope you are getting more sleep than me tonight.. and have a wonderful Valentine's Day! You are so creative... those are adorable! !